Long before Sound Horizon existed as a band, Revo shared his compositions on his personal page, compositions arguably influenced by some of the most re-known composers of Square, among others. Then, on 2001’s winter Comiket (Dec 30th) his first Concept Album “Chronicle” went on sale. All of the 1200 copies printed were sold, marking the true beginning of Sound Horizon as a doujin circle. All the tracks from the album were instrumental, videogame OST-like tracks, each accompanied by a story-rich poem in the booklet. Next year, during the 62nd edition of Comiket, Revo launched the Second Story CD Thanatos under the name “Sound Horizon”. Aramary became Sound Horizon’s first vocalist, singing in Japanese with snippets of English. This was the establishment of the “Fantasy Story Music” concept, based on using music, narration, vocals and sound effects in order to tell stories. This still remains as the emblem of Sound Horizon’s music. On December 2002, Revo hosted the web event “Thanatos party” on his website, which included three radio podcasts run by Revo and Aramary themselves. Sound Horizon’s 3rd Story CD, Lost, came out during the winter edition of 2002’s Comiket. This album, which showed a notable improvement in terms of recording quality, was the first one featuring the second vocal of Sound Horizon and first male voice, Jimang. He contributed with narration and vocals for this album. Moreover, Haruka Shimotsuki made her first collaboration with Sound Horizon in this album. During 2003, Revo worked on the remake of the first Story CD (which was being claimed and desired by most SH fans) and the 4th Story CD Elysion. In August, Revo launched two Pleasure CD’s, Pico Magic in May and Pico Magic Reloaded. Those contained re-recorded or remastered songs from previous CDs, some new songs and previews/demos from the upcoming albums. 2004: Chronicle 2nd, BELLWOOD RECORDS. The 1st Renewal Story CD “Chronicle 2nd” went on sale in March 2004. Aramary, Jimang and Haruka Shimotsuki contributed with the vocals. This was the last album by Sound Horizon as a doujin circle. Sound Horizon made the leap to Major with the launch of an album through the record label BELLWOOD RECORDS. On October 27th, the “best album” Elysion~Prelude to Paradise was released as the first major album, containing a selection of songs from the doujin era and two songs from the upcoming 4th Story CD. Some events took place on the occasion of the release at the Yamagiwa Soft store and Comic Toranoana store in Akihabara, Tokyo. After its announcement, the album managed to get to the 1st place of Amazon Japan’s preorder ranking. It also reached -once released- the 14th place of the Oricon Daily Ranking and the 35th place of the Weekly Ranking. 2005: Leviathan, Fanclub, Elysion, First concert. In February 2005, Revo released an image album called Leviathan (based on a manga of the same name by Eiji Ohtsuka and Yu Kinutani) from the label MOMO AND GRAPES. Although being tagged as a “solo” work by Revo, it included Aramary’s voice in some tracks as well as some other singers’, like RIKKI, Sizzle Ohtaka, or Geila Zilkha. 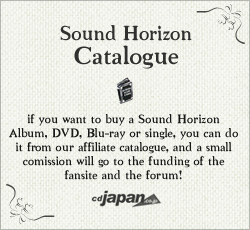 Around that time, the Sound Horizon official fanclub was settled for the first time, under the name Salon de Horizon. As usual, release celebrations of the new album Elysion took place at Yamagiwa Soft and Comic Toranoana stores, in Akihabara, Tokyo. Sound Horizon’s first live concert was on April 29th, 2005, held at the Ikeburuo AMLUX Hall in Tokyo and titled “The Sound Horizon 1st LIVE in AMLUX”. The first ‘Story Concert’ (a concert depicting strictly the content of a Story CD) was performed at Nakano Zero Hall (Tokyo) under the title “Elysion ~ Rakuen Parade e youkoso!”, and was produced by SCREAMING MAD GEORGE, a well-known horror movie producer who also worked with X JAPAN. Elysion’s Eru no Tenbin during a live performance Elysion’s Yield during a live performance. The first concert took place on the 24th of July with an additional show on the 19th of September. The Nakano Zero hall hosted about 1300 people at full capacity. In December 2005, Revo launched his second Image Album, Poca Felicità, as a standalone composer, this time for the anime Gunslinger Girl. The album featured the original seiyuus as singers, as well as a soprano opera singer. 2006: Aramary’s resignation, New Era, KING RECORDS, Roman. To promote the further DVD release of the Elysion StoryConcerts, some premium screenings of the ‘movie’ took place during January in small halls like Laforet Museum (Roppongi, Tokyo), CLUB QUATTRO (Nagoya), and Banana Hall (Umeda, Osaka). Then, the DVD was released in March, being the first LIVE-related release from Sound Horizon. The DVD reached the 2nd place of Daily and Weekly Rankings of Music DVDs at Oricon. Right after that, Revo announced the end of the Sound Horizon first era. By means of a letter published at his personal page, the leader of the band announced that Aramary was quitting the band due to personal reasons, and a deep praise to her work was stated clearly throughout the letter to keep clear that it was a peaceful resignation. At the same time, the beginning of Sound Horizon’s second era was settled with the unveiling of new singers and new release announcements. The Sound Horizon Live Tour 2006 – 1st Territorial Expansion was the first live tour of the new era, in which the new singers were introduced to the fans. The new vocal group was formed by YUUKI, KAORI, REMI, and Haruka Shimotsuki as a guest. The live toured during June to live houses like Laforet Museum Roppongi (Tokyo), SUN HALL (Osaka), Electric Lady Land (Nagoya) and Shibuya O-East (Tokyo). On September, the first fanclub event was held, under the title “Celebration of 1st Territorial Expansion Thanksgiving party”, at Osaka (am HALL), Nagoya (ASUNAL HALL), and Yokohama (Yokohama Bay HALL). After making public the tie-up collaboration with the PC online RPG “Belle Isle” as part of the upcoming single “Shonen wa Tsurugi wo…”, Sound Horizon performed at the Tokyo Game Show 2006. The concert was entitled “1st Territorial Expansion Gaiden – Descent of the Fantasy Band from the overworld”. Finally, the tie-up maxi single “Shonen wa Tsurugi wo…” was released from TEAM ENTERTAINMENT on October, achieving peaks of 6th (Daily) and 9th (Weekly). Sound Horizon’s 5th Story “Roman” was released on November through SH’s new label KING RECORDS, having been anticipated by the previous single. Stores like comic Toranoana gave a hearted promotion of the album, and it managed to reach the 15th place of the Daily ranking and the 19th place of the Weekly ranking. Despite not having massive sales, Roman was the album that, due to its softer and slightly more J-POP-ish style, allowed the band to get further acknowledgement among mainstream audience. The StoryConcert tour, entitled “Roman – Bokutachi ga Tsunagaru Monogatari” (a story that links us), started at Nakano Sunplaza (Tokyo) and went on through Zepp Nagoya, and Namba Hatch (Osaka). 2007: Seisen no Iberia, The 2nd Territorial Expansion. The Roman StoryConcert tour continued with shows at Osaka Welfare Pension Hall and the Tokyo Welfare Pension Hall. In order to promote the upcoming DVD release of the concert tour, some free screenings of the live were held in Kyoto (Kyoto Education and Culture Center), Fukuoka (IMS HALL), Tokyo (Chofushi Green Hall) and Nagoya (Imaike Gas Hall). Eventually, the DVD “Sound Horizon Concert Tour 2006-2007 ~ Un Roman qui nous Réuni” was released through KING RECORDS in April. Revo and the manga artist Yukimaru Katsura worked on a comic adaptation of the album Roman, and the series started its monthly serialization in Shueisha’s ULTRAJUMP magazine in May. In June, the Fanclub event “Celebration of the foundation of the Itinerant Kingdom – Celebration of His Majesty The King’s super-inception” was held in Stellar Ball, Tokyo. This is the turning point in which Sound Horizon became a musical kingdom, and Revo was officially crowned as its king. In August, the maxi single “Seisen no Iberia” was released, reaching the 8th place in the weekly Ranking, and right after that the 2007 tour “2nd Territorial Expansion” started in Saitama (Toda Civic Cultural Hall), and went on through Osaka (Welfare Pension Hall), Fukuoka (Zepp), Sendai (Zepp), Nagoya (Zepp), Tokyo (Nakano Sunplaza). Promotion photo with the cast of “Seisen no Iberia”. Cover of ULTRAJUMP featuring Sound Horizon. “Seisen no Iberia” during a live performance. In October, as a tour closing event, a set of three concerts entitled “Triumph of 2nd Territorial Expansion Celebration of the Fantasy Band’s 3rd Anniversary” Took place in Tokyo (Shinagawa Stellar Ball). The collaboration concert between Revo and Yuki Kajiura, titled “Dreamport 2008”, was announced to the respective fanclubs in January 2008, and three concerts were scheduled. A few weeks later, a photobook containing over 200 pages of photographs taken during the 2007 live tour was released under the name of “Triumph“, subtitled “Tracks of the Great Invasion of Territorial Expansion II“. The photobook also included a DVD with highlights of the last 3 set of concerts at the Shinagawa Stellar Ball. This was the first time that footage of songs from the first era sung by the new singers were recorded and released. In April, the first tankoubon of the Roman manga version by Yukimaru Katsura was released through Shueisha, containing the first half of stories from the album. The three Dreamport 2008 concerts took place in Kobe (World Hall), Tokyo (International Forum) and Yokohama (Pacifico Yokohama) between April and May. The theme song of the concert tour (composed by Kajiura and Revo) titled “Sajin no Kanata e (Beyond the dust storm)” was released as a single in June through KING RECORDS, along with an instrumental arrangement of the song by Kajiura. Cover of the ANICAN-R MUSIC magazine featuring Dreamport Promotion photo for the Dreamport 2008 concerts. The official announcement of the 6th Story “Moira” was done during the Dreamport 2008 concerts, and two songs from the upcoming album (Meiou and an instrumental version of Parthenos) were performed. Sound Horizon got featured as one of the guest artists at the anisong festival “Animelo Summer Live“, the 31st of August in Saitama (Super Arena). In the concert, they performed Asa to Yoru no Roman, a medley of Seisen no Iberia, and Dorei Ichiba from the upcoming album Moira. Unfortunately, their performance was not included in the DVD edition of the concert. Screenshot from the digest video of Animelo 2008. Revo during SH’s performance in Animelo 2008. The 6th Story CD “Moira” was released early in Sepember, being the third major full-length album of the band. It featured a much bigger cast, consisting of Revo, KAORI, YUUKI, REMI, Haruka Shimotsuki, MIKI, Jimang, Ayaka Naito, Yoshimi Iwasaki, Minami Kuribayashi and Takashi Utsunomiya for the vocals. This became as well the longest Sound Horizon album ever, with almost 1:30 hours of duration. The album reached the 1st position of the Oricon Daily Rank on the day of the release, and managed to stay at the 3rd place in the Weekly Ranking, being this the best reception of a Sound Horizon album at that time. Shortly after the release of the album, the 6th StoryConcerts started and several shows were performed during September in Tokyo (JCB HALL). Unfortunately, Ayaka Naito had an accident the day before the premiere and couldn’t attend the rest of the tour. In order to promote the new album and concerts, Revo attended plenty of Radio programmes and was featured in some magazines. 2009: LIVE year: 3rd Territorial Expansion, Celebration of Revo’s Inception, Major Debut 5th Anniversary. Three additional shows took place in the same hall during January, in which Mari Endo substituted Ayaka Naito and Azumi Inoue substituted Yoshimi Iwasaki. Also, the second -and final- tankoubon of the Roman manga version was published through Shueisha the same month. The third LIVE tour (that is, not featuring exclusively songs from Moira but from any other release) started in Yokohama (BLITZ) in March, under the title of “Territorial Expansion III”, and continued through Sendai (ZEPP), Sapporo (ZEPP), Tokyo (ZEPP), Fukuoka (ZEPP), Osaka (Zepp), Nagoya (Zepp) and Tokyo (JCB HALL). The two Triumph concerts, under the title “Triumph of Territorial Expansion III – Celebration of Revo’s Inception”, took place at the NHK HALL (Tokyo) on June 26th and 27th. Cover of the two tankoubon of the Roman manga series. Kuro no Yogensho during the 3rd Territorial Expansion. On the occasion of the Major Debut 5th Anniversary, a fanclub event took place in Yokohama (Kanagawa Kenmin HALL) and a movie called “5th Anniversary Movie ‘Across the Horizon'” was screened in two cinemas in Osaka and Tokyo during November and December. Revo and the director Hideaki Kikkawa attended the theaters in two special days of screening and did some introduction of the movie. The content of the movie was basically a selection of performances from the two Triumph concerts held in June, along with some cinematic scenes and four interviews. On a promotional message about the screening of Across the Horizon, Revo announced that a full-length album would be released in 2010. A special TV program dedicated to the 5th Anniversary of Sound Horizon was broadcasted on MUSIC-ON! 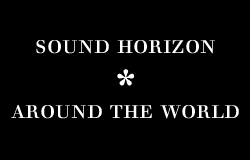 TV, under the title of “Sound Horizon 5th Anniversary Program: Across The Horizon Special”. Early in December, the DVD & Blu-Ray edition of the two Triumph concerts (Triumph of Territorial Expansion III Celebration of Revo’s Inception) was released (One DVD for each day, one Blu-Ray for each day, and a limited edition COMPLETE BOX with four DVDs containing both concerts). 2010: Ido e itaru Mori e itaru Ido, Märchen. The 5th Anniversary Movie was screened during two more days in January. Later in February, a special radio programme dedicated to Sound Horizon was aired in TBS Radio. During the program, Revo talked about the fanclub event, a recording of the event itself was broadcasted, and revo announced that a Maxi Single would be released in June and an Album would be released later in autumn. Entrance of the Sound Horizon Cafe. Entrance of the Sound Horizon Museum. Cover arts shown at the museum. The month preceeding the release of Ido e itaru Mori e itaru Ido came full of media promotion in radio (Tokyo FM, Shiga FM, FM Okazaki, Radio Kansai…) and TV (TBS, TV Aichi). Additionaly, the Sound Horizon Museum was open at the Shibuya PARCO Shopping mall during one week, displaying many objects, costumes and blueprints related to Sound Horizon, its lives, etc. In order to promote the single, a huge billboard was displayed on the wall of Shibuya PARCO. Finally, the Prologue Maxi “Ido e itaru Mori e itaru Ido” went on sale, followed by effusive promotion in stores like Toranoana or Tsutaya Records. The single entered in the 1st place of the Oricon Ranking, where it stayed for many days, and ended up in the 2nd place on its first Weekly Ranking. It sold nearly 17,500 copies on its first day and over 60,000 after a month. Right after the release of the single came the Celebration of Revo’s Inception – Holiday Special 2010 concert, held on June 19th and 20th at the Yoyogi National Gymnasium. This event gathered a total of over 20,000 people, and the second concert was screened live in 3D through the whole country at TOHO Cinemas. The new single was performed for the first time during these concerts. After a long break during summer, the exceptional site started to show some clues that finally led to the announcement of the 7th Story under the name of “Märchen”. Then, during the yearly Fanclub event held this time in Shirakabako, Revo showed to the attendees some sneak-peeks of the upcoming album. 7th Story Märchen went on sale on December 2010, carrying a huge change in the cast. While YUUKI and KAORI didn’t take part, many other singers joined. The total cast was formed by Revo, Kanami Ayano, REMI, MIKI, Joelle, Tomoyo Kurosawa (Who played young Misia’s role in the Moira LIVE), Ceui, Mikuni Shimokawa, Minami Kuribayashi, Yume Suzuki, Akio Ohtsuka and the child singers Sayumi Kobayashi, Kazuki Kiriyama and Chinatsu Ishii. The album had a great reception, overselling Ido e itaru Mori e itaru Ido, and achieving almost 25,000 copies sold the first day and almost 67,000 copies sold the first month. The 7th StoryConcerts, under the title “Kimi ga ima waratte iru, mabayui sono jidai ni (In these dazzling days you’re smiling now)“, started one week after the release in Yokohama (Pacifico Yokohama) and had two special concerts in Tokyo (International Forum A). Two more shows of the 6th StoryConcert tour were held in Yokohama in the middle of January. Shortly after, it was announced that there would be another Sound Horizon Cafe in 2011, as well as a 3D Theater version of the 6th Story Concert. The earthquake and tsunami that hit the north-eastern coast of Japan caused Sound Horizon’s schedule to make a few changes. The Sound Horizon Cafe scheduled for March and April was cancelled until further notice, and the several theater greetings by Revo programmed during the screening of the 3D Theater version of the 6th Story Concert were cancelled as well. The screenings themselves, though, took place with normality (with the exception of the theaters in Tohoku region). Shortly after the disaster, it was announced that Sound Horizon would be on tour during the summer of 2011. The title of this nation-wide tour would be “Sound Horizon Live Tour 2011 – The Great Hope of the Territorial Revival”, and a portion of the overall earnings would go directly to the relief efforts the victims of the Earthquake and Tsunami. Revo wrote a new Opening Theme for this live tour, called “Revive”, and made its lyrics by assembling verses that people had submitted to him, as it had been requested from the official website.